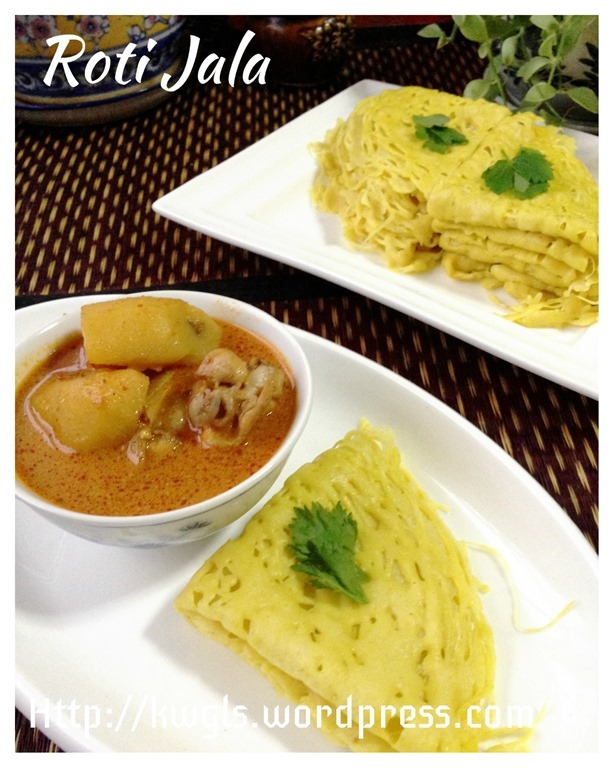 Yes, jala is net in Malay language and roti is bread in Malay language. However, in fact, it is a pancake created in a nested pattern and I was always amazed as to the way these pancakes are prepared. Some has also called it a lacy pancake.. 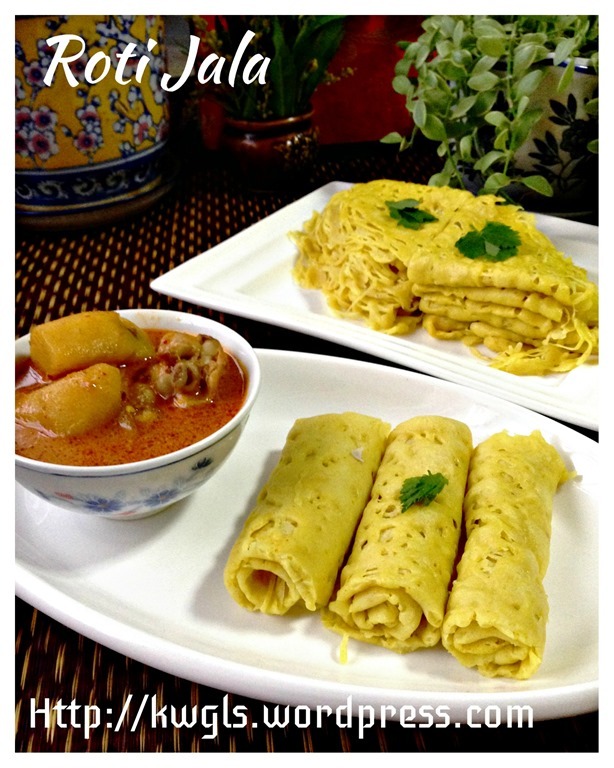 It is a beautiful pancake to look at and a delicious pancake to eat..
To be very frank, i have never eaten this special Malay cuisine before as it was not very commonly sold in the stores in Singapore.. However, I have seen this special pancake in television shows, books and newspaper.. I did not thought that I will be preparing this until I saw the special ladle sold in a Singaporean bakery. As the price is relatively cheap (less than SGD2), I have decided to buy one ladle and try out a recipe to satisfy my curiosity. 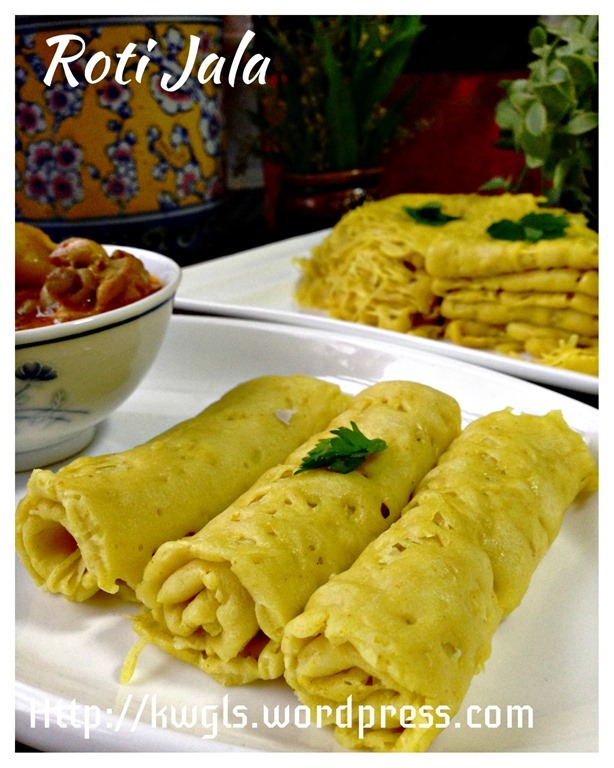 Hold on to buy this special gadget for roti Jala, it is quite easy to prepare one at home. In fact, I would think that home prepared version is less messy for the preparation of the pancake since the plastic bottle is capped. 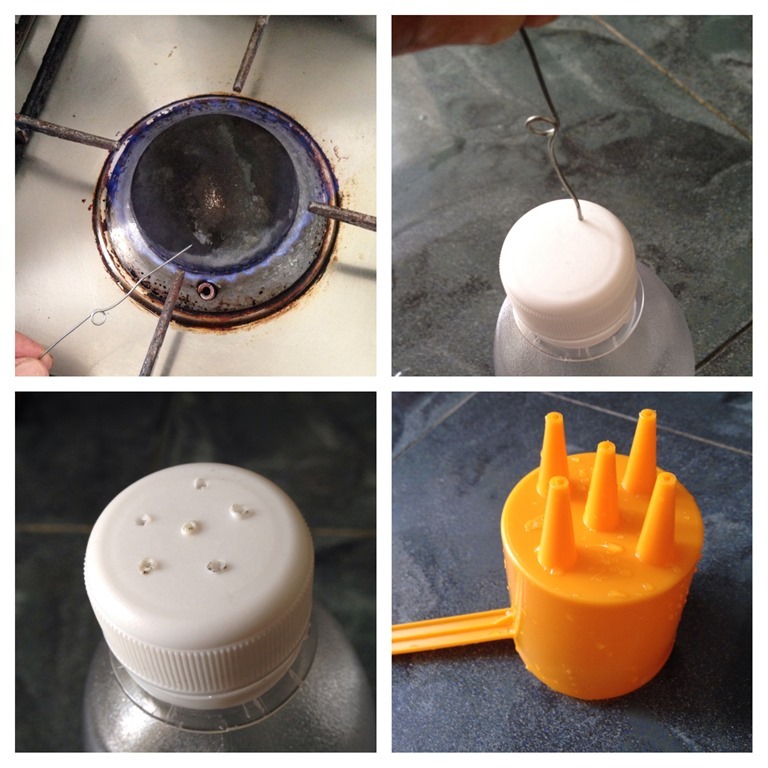 Just heat up a safety pin, use the hot pin the make some holes on the cap of the plastic bottle and the apparatus to prepare lacy pancake is done. In fact, I am very happy with the pancake.. It tasted way better than what I have expected. My kids love the texture of the pancake and I love the rich coconut aroma in the pancake that goes well some home cooked curry.. 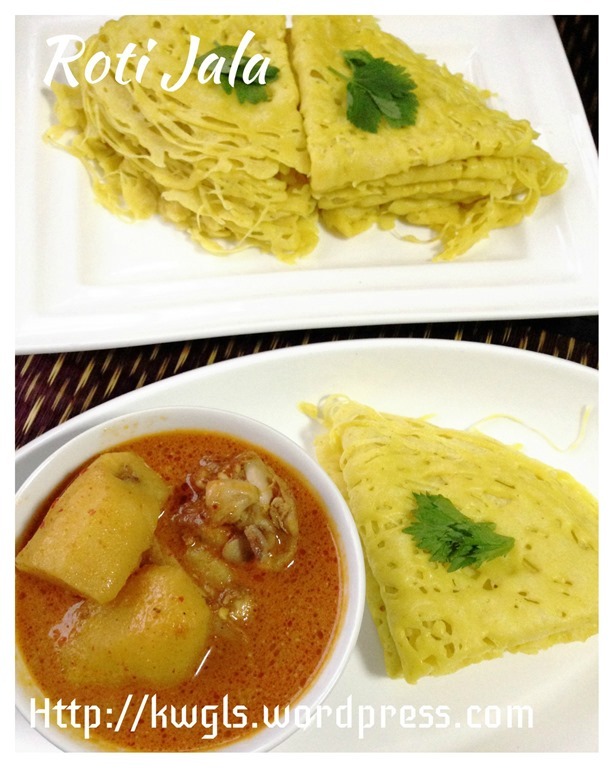 I served this with curry chicken and the pancake were disappearing very fast…. 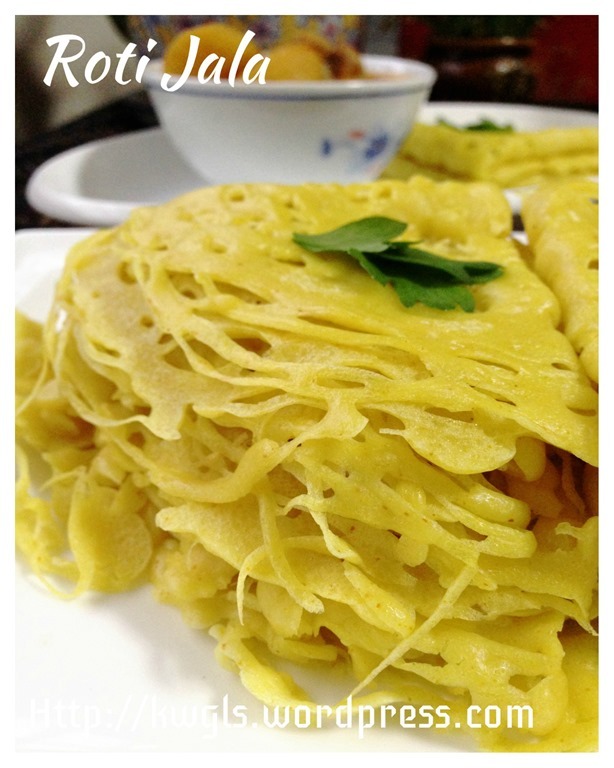 In fact, it is very addictive as the almost plain pancake just blends so well with the curry gravy. 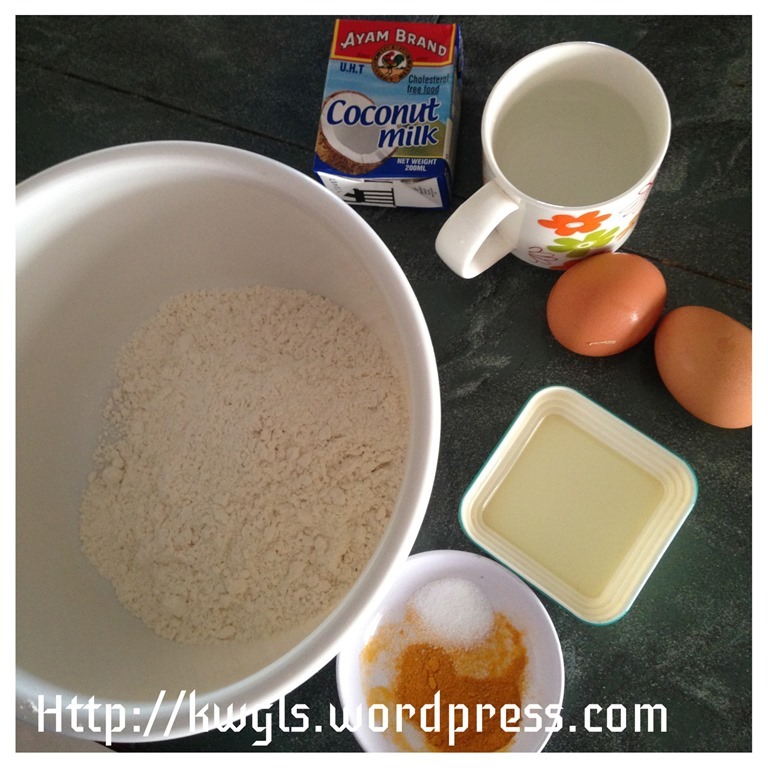 Put all the ingredients (except water and coconut milk) in the mixing bowl of stand mixer. 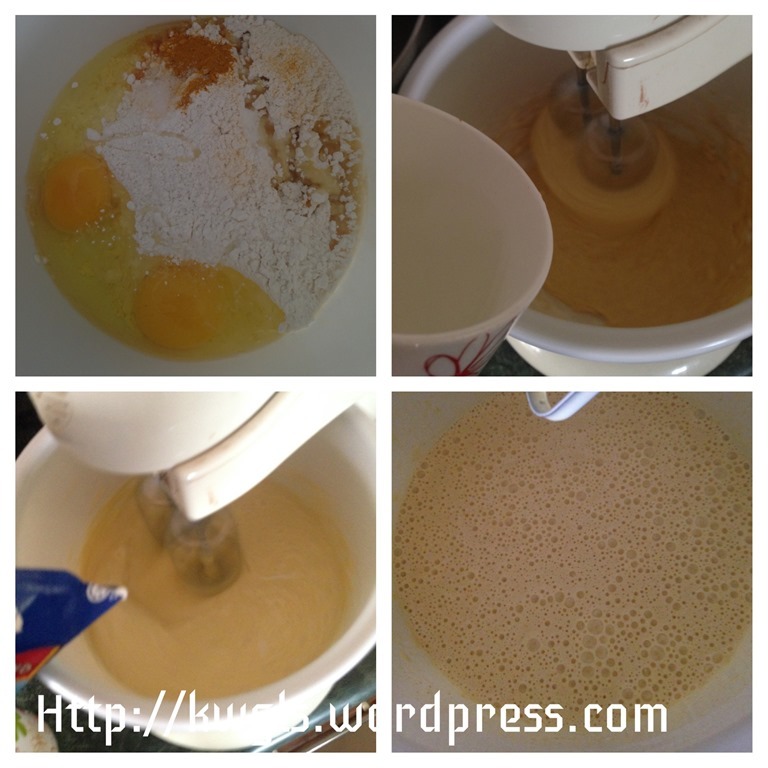 Gradually add in water and coconut milk until the batter is well mixed with no lumps noted. You can easily use a hand whisk to do the job. Sift the batter if you saw lumps that refused to be well incorporated. Lightly greased a flat cooking pan (preferred non stick pan). 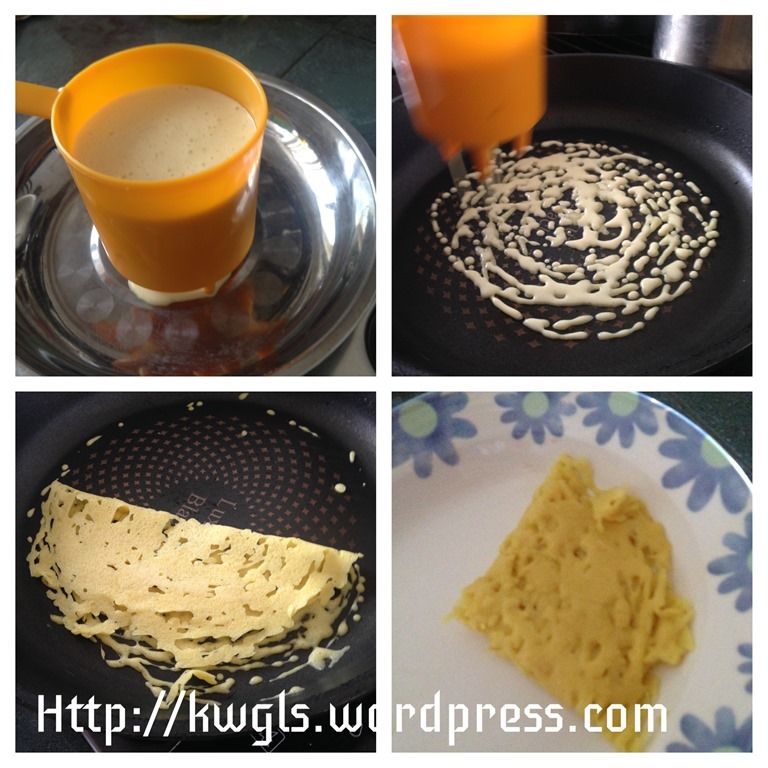 Transfer the batter to the special cup or the plastic bottle that you have prepared. 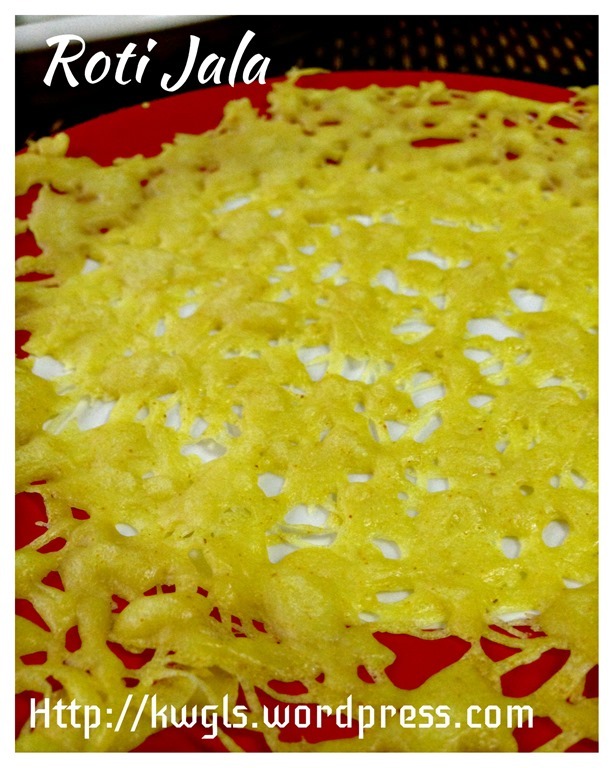 Heat up the pan using medium to high heat and drizzle the batter in a circular pattern onto the pan. When the batter is set (dries up), transfer out and fold into your desired pattern. 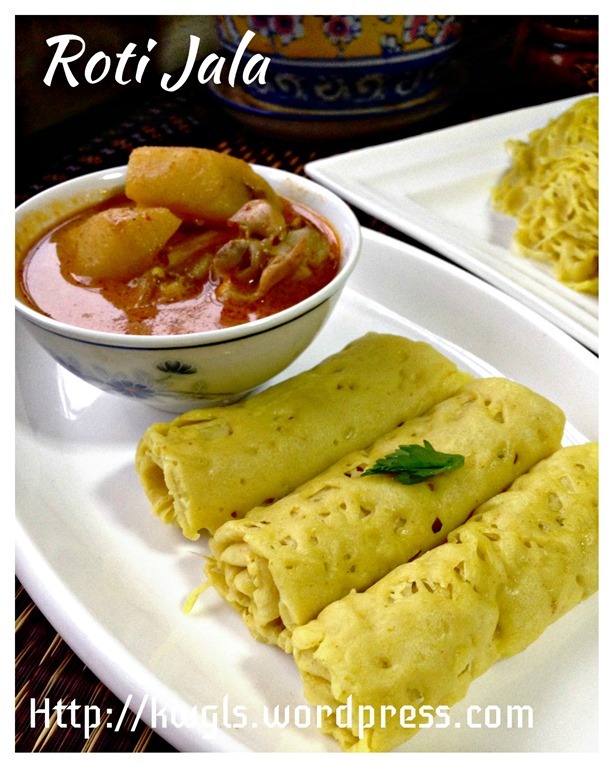 Best served warm with curry chicken or your preferred sauce. 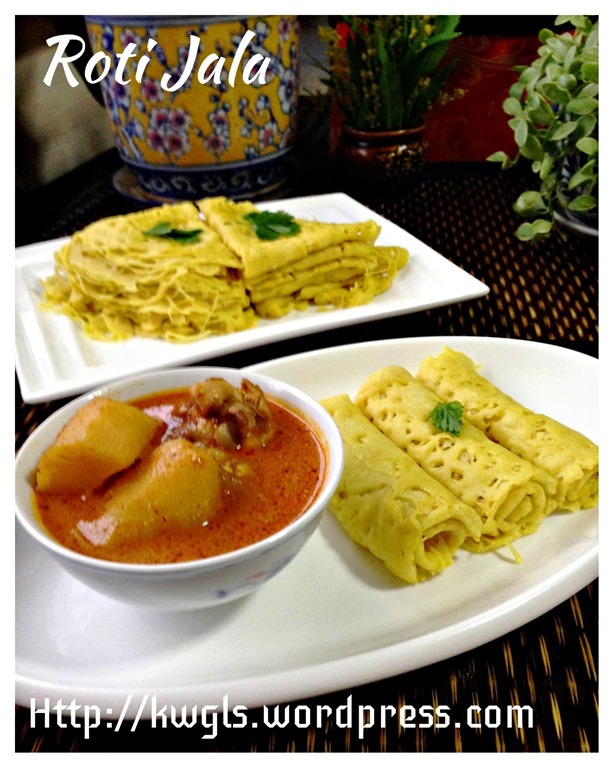 Note that roti jala can also be a dessert to be served with thick coconut milk and palm sugar. I am definitely going to prepare this again. 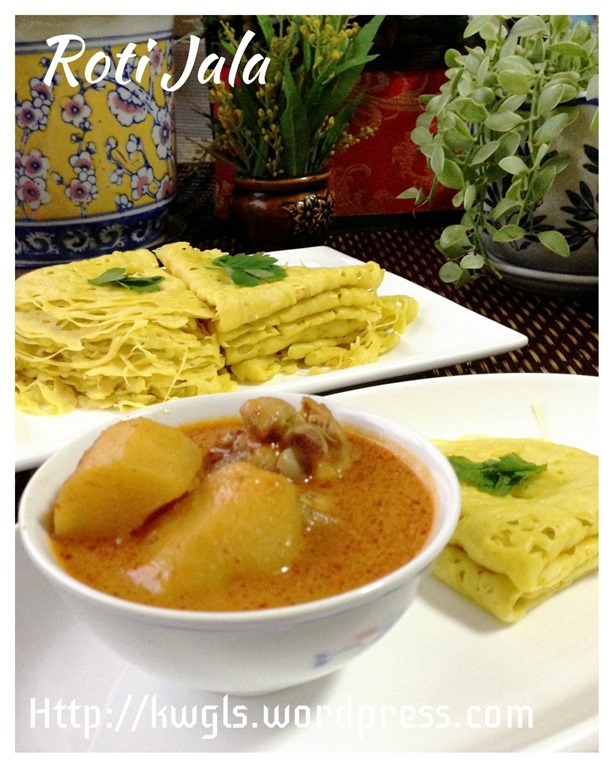 My roti jala may not be the most beautiful for the time being but the taste is awesome and i presumed in my next attempt, it will look much better than this batch.. Is it not practices make perfect? 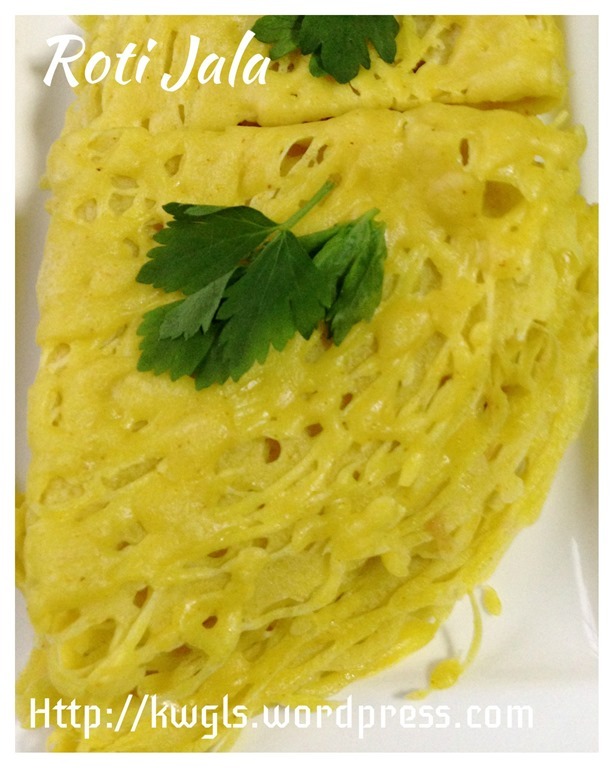 For more recipes, you can refer to my RECIPE INDEX (updated as at 20 November 2014) here and you can follow me at PINTEREST or visit the blog’s FACEBOOK PAGE to keep abreast of my future posts. 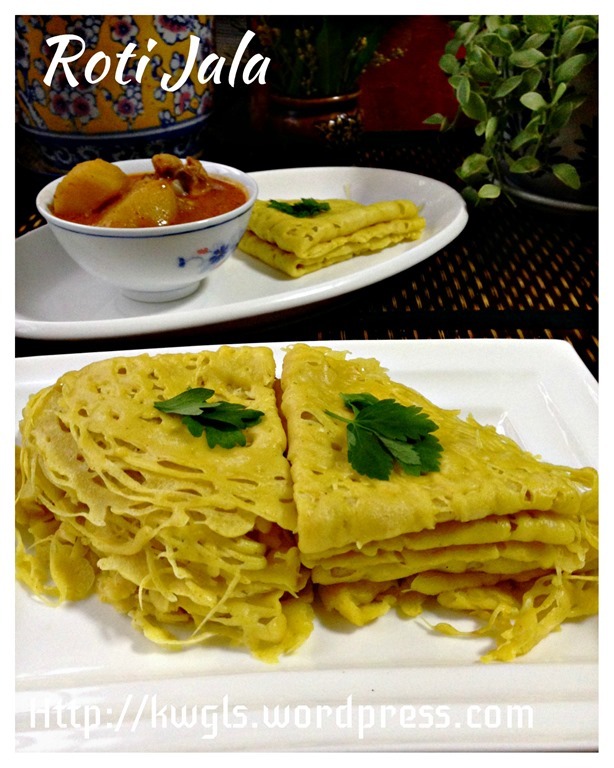 This entry was posted in Chinese and Asian Cakes and Snacks, Food Preparation Series, Noodles, Rice and Others and tagged 8, 网面薄煎饼，, GUAI SHU SHU, Guaishushu, kenneth goh, lacy bread, lacy pancake, malay cuisines, nested bread, postaday, roti jala. Bookmark the permalink.